Small businesses targeted this time around. Iranian police will launch a crackdown next month on small companies which fail to enforce strict religious dress codes, Mehr News Agency reported on Wednesday. The move indicates an expansion of a clampdown on "immoral" conduct launched last year against women flouting rules to cover their heads and disguise the shape of their bodies in public, in line with Iran's Islamic system. "In the first stage, police will only confront companies ... that are active in small buildings or complexes," the head of the moral security police, Ahmad Rouzbehani, was quoted as saying. Mehr said the move was "to prevent social damage" and the hijab, or veil, "should be respected". It said the campaign would start from around May 4. Iran's religious codes require women to cover their hair and wear long, loose clothing to disguise their bodies in public, including offices where they may work with male colleagues. .....offices to ensure the codes are upheld and can shut them down. Some coffee shops have been closed after police said workers or customers were not meeting standards. Restaurants and other public places often have signs asking customers to respect the Islamic Republic's dress requirements. 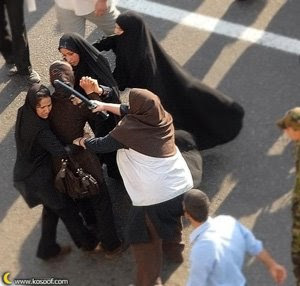 The enforcement of "hijab" has been a cornerstone of the Islamic system introduced after the 1979 revolution. The crackdown against what clerics see as "corrupt" Western influence coincides with rising pressure on Iran by the West over its nuclear program. The United States and its allies say Iran wants to build an atomic bomb, which Tehran denies. "Everybody, both women and men, just as they want financial and physical security, like to have moral security," Rouzbehani said, adding that police had urged people "to come forward with their reports". In the past, crackdowns tended to be launched at the start of Iran's hot summers and petered out soon after. But last year's extended into winter and included a drive against tight women's trousers and even men with spiky "Western" hairstyles. Those who violate dress codes are usually cautioned on a first offence, sometimes after a brief visit to a police station. But they can be held for longer, taken to court and required to have "guidance classes" after repeat offences. Dress codes are most often flouted in wealthier, urban areas. Conservative dress is the norm in poorer, rural areas. Attack originated in Pak tribal region - says intelligence honcho. Afghan officials say at least seven people were killed when security forces raided a hideout housing militants involved in Sunday's attack on President Hamid Karzai. Afghan intelligence chief Amrullah Saleh says troops surrounded a house in the capital, Kabul, Wednesday, trading fire with Taliban militants. Saleh says at least one of the dead militants directly participated in Sunday's attack on President Hamid Karzai during a military parade in Kabul. Mr. Karzai escaped unharmed. The intelligence chief also says there is evidence that militants based in Pakistan's tribal region planned the assassination attempt. But Saleh says he has no proof the Pakistani government was involved. Saleh told Afghanistan's Parliament Tuesday he knew of the plot to murder President Karzai and had warned the Afghan leader and his security advisor. Just in case you were wondering...US cites new evidence of Iranian support for Taliban. And Iran IS the biggest state sponsor of terrorism. A U.S. State Department report says Iran remains the world's most significant state sponsor of terrorism, and that al-Qaida is regaining strength in enclaves in Pakistan. The congressionally-mandated report says North Korea might soon be removed from the U.S. terrorism list. VOA's David Gollust reports from the State Department. The report, covering calendar year 2007, says the number of terrorist incidents worldwide declined slightly from 2006, to about 14,500, and that both terror attacks and fatalities in Iraq had begun a steep decline by the end of the year. But overall deaths from terrorism increased about eight percent in 2007 to more than 22,000 and quadrupled in Pakistan, where extremists based in remote tribal regions took a violent campaign against the Islamabad government nation-wide. The report identified Iran as the world's most active state sponsor of terrorism with support for hard-line Palestinian factions opposed to U.S.-led peace efforts, Lebanese Hezbollah militants, and Iraqi insurgents. At a briefing for reporters, the head of the State Department's Office for Counterterrorism, Dell Dailey, said Shiite Muslim Iran is also providing aid to Sunni Muslim Taliban insurgents in Afghanistan in what he termed a shrewd tactic to keep U.S.-led coalition forces under pressure. "Let us keep sending arms over there to just keep the coalition forces, the United States in particular, but probably the others embroiled and busy, and distracted," he said. "Because the last thing I would suspect that the Iranians want, is a totally pacified Afghanistan with a U.S. base on their immediate eastern side." The report said al-Qaida and associated groups remained the greatest terrorist threat to the United States and its partners. It said al-Qaida - though greatly diminished since 2001 - has rebuilt some of its operational capabilities in safe-havens in the Pakistani tribal areas bordering Afghanistan. It said while numerous al-Qaida operatives have been captured or killed, the organization - under the strategic and operational leadership of Egyptian-born Ayman al-Zawahiri - is cultivating stronger connections with affiliates in the Middle East, North Africa and Europe. Statistics in the report were compiled by the U.S. government's inter-agency National Counterterrorism Center. Its deputy director, Russ Travers, told reporters that well more than 50 percent of the more than 72,000 people killed or wounded in terror attacks in 2007 were Muslims and that mosques and Muslim schools, especially those for girls, were increasingly targeted. "We drew only on al-Qaida-affiliated claimed attacks and we find that those attacks killed something like 5,400 civilians, at markets, at funeral processions and so forth," he said. "That number also is much higher. But these are only attacks that al-Qaida-affiliated groups claimed responsibility for." The U.S. list of state sponsors of terrorism remained at five countries - Iran, Syria, North Korea, Sudan and Cuba. But it credited Sudan with cooperation in the war against terrorism. And it said North Korea - which is not known to have sponsored any terrorist acts since 1987 - could be dropped from the list as part of the six-party accord under which it is to scrap its nuclear program. The report noted that Venezuela has been designated under U.S. law as not cooperating fully with U.S. anti-terrorism efforts. It said the government of President Hugo Chavez deepened ties with designated terrorism sponsors Iran and Cuba, and provided ideological sympathy and refuge, if not material help, to leftwing FARC and ELN insurgents from neighboring Colombia. God bless you Jonathan Cote. A year-and-a-half of waiting has ended with anguish for family and friends of a former University of Florida student who was abducted in Iraq in 2006 while working for a private security firm. The body of Army veteran Jonathon Cote, 25, was recovered last week and identified Wednesday by the FBI. Cote's father, Francis Cote of Getzville, N.Y., said Thursday he still does not know how his son died. "Was he strong? Did they feed him? Was he starved to death? What are those things that happened to him?" he asked during a news conference in New York. Autopsy results are expected in six to eight weeks. Cote's mother, Lori Silveri of Aventura, could not be reached Thursday for comment. Florida fraternity brothers mourned Cote's passing, recalling an adventurous young man who was older than his years. Cote had served as a paratrooper in Iraq before enrolling at UF in August 2005. Fellow students gravitated toward his outgoing personality and realized he "wasn't your average freshman," friends said. "He had this confidence — he had seen and done it all by then," recalled Dane Eagle, who was Cote's "big brother" in the Sigma Phi Epsilon fraternity, someone Cote could go to for advice and support. "He ended up being more my mentor than me to him." Cote, a native New Yorker, began studying accounting at the Gainesville campus, but by the end of the school year decided college life didn't provide the excitement and sense of duty he craved, said fraternity president Matt Sloan. So he decided to return to Iraq, this time serving with the private security firm Crescent Security Group, to make extra money that would help him pay for his schooling. "He felt guilty. He was in paradise — at UF in beautiful weather, with beautiful girls — but it gnawed at him that there were people still over there," Sloan said. "He felt an obligation to those still serving." 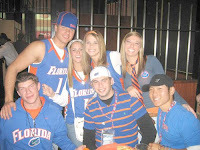 Cote was making plans to return to UF when we was kidnapped in Iraq with three other Americans and an Austrian on Nov. 16, 2006. Suspected militiamen, wearing Iraqi police uniforms at a fake checkpoint, ambushed a convoy of trucks they were escorting on a highway near the southern border city of Safwan. The Cote family suspects the Crescent employees were set up, perhaps by disgruntled Iraqi Crescent workers angry over their pay and treatment. The Iraqi employees working with Cote had failed to show up for work the day of the ambush, the father said. He also suspects the hostages were tortured and passed among groups to the highest bidder. "But in the end, I think they just got tired and decided that America is going to pay for us being there. And Jon was one of those that paid the price." Cote and other Crescent captives appeared in two videos released by the unidentified kidnappers in the months immediately following their abduction. In one, Cote, dressed in civilian clothes, said: "I can't be released until the prisoners from the American jails and the British jails are released." Still, family held out hope Cote still lived, creating a Free Jonathon Cote! Web site. Fears for the abductees' safety were heightened in February when five severed fingers were delivered to U.S. authorities in Iraq. DNA tests revealed that each was taken from one of the Crescent employees, including Cote. The other hostages appeared to have been killed two to six months ago, Cote's father said Thursday. Jonathon's body was covered with dirt, as if he had been buried. "The only thing you think of is, these guys are just criminals and don't have any conscience. I mean, how do you do this to people?" he asked, his hands gripping the podium. Our thoughts and prayers are with Jonathan's family and friends. Words cannot express how sorry we are at the loss of this beautiful young man. Next week is going to be jammed too. I have been serving as a Senior Independent Project mentor to a high school senior this year and will travel back to Phila next week to help put the finishing touches on his project, a history of his extended family's Katrina experiences. He has compiled a 150 page manuscript that we will publish via Blurb and submit for the review of the project committee at the end of May. It's going well so far - but the deadline is fast approaching and we are under the gun. Wish us luck! It will also feature an audio statement recorded for the event by psychiatrist Dr. Wafa Sultan, a courageous opponent of Shariah law and Islamist extremism. Dr. Sultan has been forced into hiding in America due to threats against her made by Sheikh Yusef al-Qaradawi, head of the European Council on Fatwa and Research and a driving force behind the 20th Century invention of Shariah-Compliant Finance. I am Wafa Sultan. I was born and raised as a Muslim, and had lived for the first three decades of my life under Islamic Shariah which reduced me to subhuman creature. And here I am, living in the United States of America, the cradle of freedom and Western civilization, regaining my rights and enjoying my humanity. It’s my responsibility and out of respect and appreciation I have made it my mission to warn my fellow Americans against the danger of applying Islamic Shariah, which violates the basic human decencies. 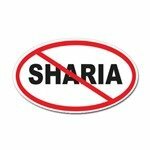 Applying Islamic Shariah here in America is an insult to every human being that values our way of life, especially to every man and woman who are (sic) risking their lives to get rid of it in their Islamic countries. on Al Jazeera, he accused me of insulting Allah and Muhammed. And it is due to his accusation that I am in hiding. Can you comprehend yourself as an American citizen living in hiding in your own country? Please don’t take your freedom and other Western values for granted; defend them and stand up against the hateful Islamic Ideology backed by Shariah law. Likewise, it would be shameful for all of us to set still and allow the Islamists to prevail. Thank you for providing me with this opportunity to express my strong opposition to apply any decree of Islamic Shariah law. "the growth of recruitment of those willing to die for the holy war is most terrifying." Tunisia warned about al Qaeda's spectacular hits. Algeria has warned its North African neighbors that al Qaeda terrorists are planning "spectacular attacks" to destabilize local governments and strike at industrial installations...According to the French Institute for International Relations in Paris, Tunisia is one of the main targets because of its friendly relations with the United States and its successful antiterrorist activities...In various messages, some on the Internet, al Qaeda has warned of the "approaching punishment" for Tunisian President Zine el Abidine Ben Ali, "whose regime obeys orders of the West and combats the Islamic veil." Tunisia has banned women's head scarves in public buildings, considering them to be a political statement...Tunisia last fall called on its neighbors to pool their antiterrorism resources...Then, at a conference on terrorism, Mr. Ben Ali said, "Tunisia was among the first to have warned against the pernicious consequences of this phenomenon and stressed the need for intensifying cooperation to guard against it and eradicate it." With a supermodel on one arm, and big fat letters of intent to build a "700 megawatt conventional power plant in Tunisia", to sell 16 Airbus aircraft to Tunis Air and with "signed accords on nuclear cooperation, migration and aid" on the other, Nicholas Sarkozy cut a wide swath through Tunisia. Reuters has to be the turd in the punchbowl at the occasion with this lede, of course. French President Nicolas Sarkozy dismissed concerns over Tunisia's human rights record on Monday, portraying its counter-terrorism efforts as a bulwark against the emergence of a "Taliban-type" regime in north Africa. In a speech at the start of a trip aimed at boosting economic ties with one of France's closest Arab allies, Sarkozy said he would not give lessons on human rights and Tunisia had made advances in granting more personal freedoms. Tunisia is the Maghreb's most westernised state, but rights groups accuse the government of muzzling the press and beating and jailing opponents. It denies the accusations. Sarkozy said President Zine al Abidine Ben Ali was fighting against terrorism, "which is the true enemy of democracy. For France the fight undertaken here is important," he said. "Because who could believe that if tomorrow, or after tomorrow, a Taliban type regime was established in one of your countries in north Africa, that Europe and France could feel secure? I call on everyone to reflect on that." Tunisian authorities have cracked down on anyone showing a readiness to join al Qaeda abroad or build support for it at home. Local lawyers say about 1,000 people have been arrested since 2003 on terrorism charges, including for recruiting fighters for the Iraqi insurgency against U.S.-led forces. To remind us that the fight is not over. starring Buffy T. Wentworth, the unfortunate Typical White Interloper. R.H. Potfry and Buckley F. Williams? It's as plain as The Nose on Your Face. Prosecutor general says young Iranians must be protected from harmful cultural effects of figures inundating Islamic republic's toy market. Iran's toy market is being inundated by models of Barbie, Batman, Spiderman and Harry Potter and the young must be protected from their harmful cultural effects, the prosecutor general was quoted as saying on Sunday. "Promoting figures like Barbie, Batman, Spiderman and Harry Potter and the uncontrolled import of CDs of video games and films should alarm all the country's officials," Ghorban Ali Dori Najafabadi was quoted as saying by the student ISNA news agency. "We need to find substitutes to ward off this onslaught, which aims at children and young people whose personality is in the process of being formed," he added. Dori Najafabadi's comments came in a letter to an Iranian vice president, urging measures to protect "Islamic culture and revolutionary values". While officials regularly lambast Western culture for polluting the minds of the public, Western toys have become a regular and popular feature on the shelves of toy shops in Iran in recent years. Affluent Iranian parents are known for indulging their children and the purchase of such toys has become for many an obligatory treat. But Dori Najafabadi said, "These toys, which do not respect the required norms, present dangers for the health of children and affect the survival of toy factories in this country." Two years ago, police raided toy shops to put black stickers on the packaging of Barbie dolls to hide their bodies. In public in Iran, women must cover all bodily contours, a rule that Barbie conspicuously fails to obey. Iran has already launched its answer to Barbie and her partner Ken – Sara and Dara, who show full respect for the country's Islamic rules. But they have not succeeded in countering the popularity of Barbie. Afghan President Hamid Karzai and Canadian ambassador Arif Lalani were among the dignitaries forced to take cover Sunday when automatic gunfire erupted during a ceremony marking 16 years since the overthrow of the country's Soviet-backed rule. Karzai, his cabinet and foreign diplomats who were present - including Arif Lalani, Canada's ambassador to Afghanistan - were all safe, a statement from the presidential palace said. But it said a local Shiite Muslim leader was killed and nine others, including two parliamentarians, were wounded. A Taliban spokesman claimed responsibility for attack, saying it had deployed four militants with suicide vests and guns to target the president. Hundreds of people fled in chaos as shots rang out. Firing appeared to come from ruined houses about few hundred metres from where the VIPs were seated. A live TV broadcast of the ceremony on a parade avenue in Kabul was quickly cut. Witnesses could also hear heavy weapon fire. An Associated Press reporter saw President Karzai escorted from scene, surrounded by bodyguards and leaving in one of four black Land Cruisers. He could not get a clear view of the president. Karzai later appeared on national TV and said some suspects were arrested. "President Karzai condemns this act and asks for all the people to remain calm," the palace statement said. Several Western officials confirmed Karzai was unhurt and had returned to the presidential palace. Embassy officials confirmed that both Lalani and U.S. Ambassador William Wood had escaped unharmed. Sirajudin, a police officer at the scene, said he saw two people firing AK-47 assault rifles from a house opposite where Karzai was sitting. UN spokesman Aleem Siddique cited a UN diplomat at the scene as saying between three and five people opened up with small-arms fire toward the dignitaries. He confirmed all the foreign dignitaries were safe. 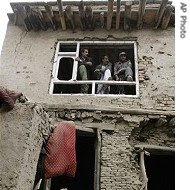 The gunfire erupted as the national anthem ended at ceremonies marking the capture of Kabul from the Soviet-backed government by the mujahedeen in 1992. In video footage shown live on Afghan TV, two lawmakers who were sitting about 30 metres from Karzai were seen to be hit by the gunfire. One of the men slumped back in his seat, while the other lay on the ground. People at the ceremony ducked for cover then fled - among them Afghan police and soldiers who were assembled for the pageantry. Karzai had just completed a drive-past in a U.S.-supplied Humvee jeep. Security forces deployed elsewhere opened fire at the houses where the attackers appeared to be. Taliban spokesman Zabiullah Mujaheed said four insurgents launched the attack against Karzai near the national stadium where the event was held. Mujaheed said the insurgents were wearing suicide vests and carrying AK-47s and rocket-propelled grenades to attack Karzai. There was no immediate report of any suicide bombing. Mohammad Saleh Saljoqi, a lawmaker at the ceremony, said two rocket-propelled grenades landed near the dignitaries and there was continuous AK-47 fire. One rocket hit inside the Eid Gah mosque opposite where Karzai was sitting. The second hit when the president had already left, landing about 50 metres away, Saljoqi said. He said the bullets were fired from the west of the where the officials were sitting. The attack came despite unprecedented tight security for Sunday's anniversary. For days Kabul was ringed by checkpoints with security forces and intelligence officials searching vehicles. The area where the ceremonies took place had been blocked by troops, tanks and armoured personnel carriers. The live TV coverage of the assassination attempt will add to the sense of insecurity in the Afghan capital, which has been spared the worst of the violence as fighting has escalated in recent years between Taliban insurgents and NATO and U.S.-led forces, leaving thousands dead. Karzai's narrowest escape from attack during his tenure as president came in September 2002 when a gunman opened fire at close quarters as he visited the southern city of Kandahar. Three people, including the gunman, died in that attack. 10 were killed on Saturday in a raid in Sidi Yahia. They were planning "spectacular operation with media effect" in the name of the rebel group Al-Qaida in Islamic North Africa. 14 were killed in their mountain hideouts on Sunday. Their previous handiwork includes: claiming responsibility for two double-suicide attacks in Algiers. The most recent, in December, destroyed UN offices, damaged a government building and killed 37 people, including 17 members of the UN staff. Algeria has been battling an Islamic insurgency since 1992, when the army cancelled the second round of Algeria's first multiparty elections to block a likely victory by a now-banned Muslim fundamentalist party. As many as 200,000 people are estimated to have died in the violence, which had largely ebbed until militants began working under the al-Qaida banner. 200000 people killed and not a peep out of the so-called Islamic moderates of the world. Why is that, I wonder??? Pirates take their loot and disappear. Spain, of course, wouldn't confirm the ransom payment but claim that they have "taken steps so that similar situations don't happen again." Somali pirates freed a Spanish fishing boat and its 26-member crew after a ransom of $1.2 million was paid, a Somali official said. Suspected pirates armed with rocket-propelled grenades had seized control of the tuna-fishing boat from Spain's Basque region last Sunday about 200 nautical miles off the coast of Somalia, a region where piracy has escalated recently. The pirates released the ship Saturday, authorities said. The crew was freed after Spanish authorities paid the ransom, Abdi Khalif Ahmed, chairman of the Haradhere local port authority in central Somalia, said late Saturday. "The ship is free and the pirates disappeared into their villages," he said. Spanish officials did not confirm that a ransom was paid before Saturday's release, saying only that there had been negotiations. In Madrid, Spain's Deputy Prime Minister Maria Teresa Fernandez de la Vega said Saturday that the trawler, the 250-foot-long Playa de Bakio, was sailing home escorted by a Spanish frigate. She would not comment on any ransom. 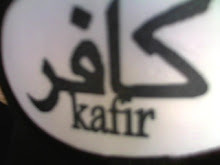 fighting the jihad, instead of going here today. Garden of the Gods It was August of 1859 when two surveyors started out from Denver City to begin a townsite, soon to be called Colorado City. 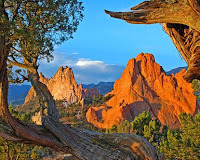 While exploring nearby locations, they came upon a beautiful area of sandstone formations. M. S. Beach, who related this incident, suggested that it would be a "capital place for a beer garden" when the country grew up. His companion, Rufus Cable, a "young and poetic man", exclaimed, "Beer Garden! Why it is a fit place for the Gods to assemble. We will call it the Garden of the Gods." It has been so called ever since. Manitou Springs: Manitou Springs is located 65 Miles south of Denver (see Map) 4 Miles west of Colorado Springs Hidden between the Garden of the Gods and Pikes Peak, America’s most famous mountain, lies the magical town of Manitou Springs. "Manitou," a Native American word for "spirit," describes this beautiful mountain community. Nine named mineral springs throughout town are fed by the snows of Pikes Peak. Long before white men traveled here, the Ute, Cheyenne and many other natives considered this area sacred. Seven Falls: the“Grandest Mile of Scenery in Colorado”. Located in South Cheyenne Canyon, Seven Falls cascades 181 feet in seven distinct steps down a solid cliff of pikes peak granite. Crystal clear water from the southern most edges of the Pikes Peak watershed have, over the ages, carved this unique scenic masterpiece in an easily accessed location. The Ghost Town Wild West Museum. a true preservation of Colorado’s western past, Ghost Town Museum is a fun and historic look back at kind of old west town that used to dot this region during the late1800’s and early 1900’s. Cave of the Winds. Cave of the Winds literally makes your jaw drop in wonder and astonishment. It is geology and adventure rolled into one—a true, unique GeoVenture! 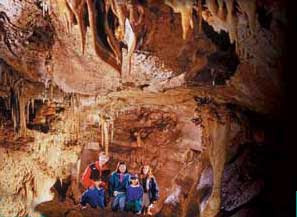 Located in scenic hills above historic Manitou Springs, the caves are one of America’s most important show caves. Visitors have shared in the stunning beauty of Cave of the Winds for over a century. Don't think we'll have time to hit Pike's Peak today. Maybe next week? Hide the ashtrays! Put away the china! New State Department lexicon to forbid use of the words jihad or jihadist. A reliable source has informed me that Condoleeza Rice has approved a new lexicon for State Department usage, absolutely forbidding the use of the terms "jihad" and "jihadist" by any State Department official. The argument, of course, is the old Streusand/Guirard claim that by using the word jihad, we're validating the jihadist claim to be waging jihad. Of course, it's ridiculous to think that the U.S. State Department carries any validating authority within the Islamic world to determine what is Islam and what isn't. This would be the first time that unbelievers have set the meaning of Islamic theology for Muslims. Also, the claim is that by using the word "jihad," we are insulting the peaceful Muslims who are waging the daily jihad of the struggle against sin, the struggle against the dirty dishes, etc. And that's great, if that's what any Muslim actually believes is the sum and substance of jihad, but it is an understanding of jihad that is at odds with the Qur'an, the Sunnah, and all the schools of Islamic jurisprudence. 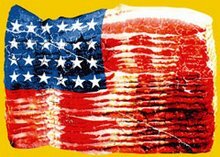 Will Muslims be insulted by a reference to other Muslims using the traditional primary meaning of jihad? Answer: probably. But that doesn't negate the traditional status of that meaning, or the influence of that traditional view in the Islamic world. I will publish more information on this when possible. I will be found sweeping up the broken glass in my office until then. Somali troops stormed a Dubai-flagged ship on Tuesday that had been hijacked off the Horn of Africa nation, releasing its crew and arresting seven pirates, authorities said. They pledged to do the same to rescue a Spanish ship held by pirates since the weekend. "Our troops stormed on to the Al-Khaleej and engaged the pirates. There was brief fighting before they defeated them," Abdirizak Hared, the mayor of Bosasso port, told Reuters. The Al-Khaleej had been carrying food and new cars for sale in Somalia when it was raided by pirates seven km (four miles) off Bosasso, in the Gulf of Aden on the northeast coast, on Monday. After the Al-Khaleej was brought into Bosasso port under guard, a Reuters witness saw 16 crew members of Asian origin who appeared safe. He also saw seven pirates in chains, three of them bleeding. Police escorted them to a waiting van and drove them away under tight security from the port in Puntland region. The ship, and cars on it, showed bullet marks. It's time for the Ask Uncle Ayman Show! al Qaeda's number two has issued the second part of his ask Uncle Ayman show. In it he takes Moslems to task for not backing insurgencies, threatens Japan for helping out the crusaders and vows Lebanon will play a pivotal role God willing in fighting the crusaders and jews. He also attempts to nip in the bud the nasty rumor out there that AQ wasn't responsible for 9/11 - the Jews were. That nasty rumor was started by Shia Hezbollah to discredit Sunni al Qaeda, he sniffs. There is definitely an increase in anti-Iranian rhetoric with this tape and he goes so far as to assert that the US and Iran have teamed up to attack Moslem homes. He even jumps on the global warming bandwagon predicting that "global warming would would make the world more sympathetic to and understanding of the Muslims' jihad against the aggressor America." Hah-hah. 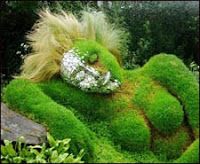 Al Qaeda goes green. claimed that the Taliban took over 95 percent of Afghanistan and is sweeping Pakistan as well. "Residents of the provinces and various regions welcome the Taliban and urge them to come to purify their regions of corruption; this is the secret of Taliban quick deployment and gripping control of 95 percent of Afghanistan," he said. "The crusaders and their agents in Pakistan and Afghanistan are starting to fall," al-Zawahiri said. This makes me want to throw something at somebody. Pakistan to release Maulana Sufi Muhammad, the firebrand religious cleric and leader of the Tehrik-i-Nifaz-i-Shariat-i-Muhammadi or Movement for the Enforcement of Islamic Laws, was arrested in 2002 after he led 10,000 fighters into Afghanistan to join the Taliban. His movement was banned by Pakistan's president Pervez Musharraf. Sources inside Pakistan's interior ministry told Adnkronos International (AKI) that Muhammad has been shifted to a safe house under an agreement aimed at having him broker a peace deal with his al-Qaeda backed son-in-law Mullah Fazlullah in the Swat valley in northwest Pakistan and in the tribal area of Bajaur. Fazlullah is a pro-Taliban cleric who has been engaged in fierce battles with the security forces in the Swat valley. The militants have been fighting for Sharia or Islamic law. 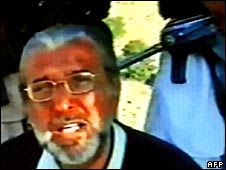 "We have also learnt that our father will be released," Moulvi Rizwan, Muhammad's son told AKI in a telephone interview. "Our movement is peaceful and we consider the Pakistan army, our army. We will continue our struggle through peaceful means," said Rizwan. I know I said that one of the hostage negotiators working for the release of the Austrian couple was killed. Correction. Make that three of the hostage negotiators have been killed. This is what we're dealing with here. Sickening savage bastards that's all I can say. May God bless the hostages and grant them some measure of grace and comfort at their hour of need. The Polite Pirating Guide...they even brought their own goats! The only violence was when one pirate shot another pirate over drugs. This whole business is starting to sound like al Qaeda got the Six Sigma memo to me. First the marked increase in hijackings, then the 80/20 split on the Le Ponant ransom and now this? Bandits who hijacked a luxury yacht and held 30 people hostage insisted they followed a "polite pirating guide". The six raiders claimed they had a good conduct manual on how to seize foreign vessels to ensure their prisoners felt "relaxed and cheerful" during their week's captivity. The written guide said they must not sexually assault women hostages, not shout at prisoners, give them food and drink regularly and let them sleep and use the toilet when they ask. The gunmen even brought goats on to the 290ft French yacht, inviting their captives and 20 friends from their village in Somalia to an on-board barbecue. When one pirate's gun accidentally went off and narrowly missed the boat's doctor he was sent off for "carelessness". The only violence was when one pirate shot another dead in a row over drugs. Stockholm syndrome is a reality. The mostly French crew, who are returning home, said the pirates never abused them. One told French newspaper France-Soir: "We really didn't have a bad time at all. At first it was frightening when men with guns boarded but we soon realised they were pretty nice guys. They were calm and polite and hardly even raised their voices. Luckily they got what they wanted and left, because they didn't look like they really wanted to kill us." Let them sleep when they want. The Le Ponant and the French frigate currently guarding it. The latest on the Le Ponant Pirates now languishing in a Parisian jail. It's hard for me to get too worked up about their fate at this point. Not when I agree with my good friend MK, that shooting the lot of them on the spot would have probably spared the crew of the Playa de Bakio the fate they are suffering today. Cadena Ser, a Spanish radio station, said it managed to get through to the Spanish fishing boat and hold a short, frantic conversation with one sailor. In the space of 12 seconds, the sailor asked four times that the broadcaster not call back. "Please do not call back. They are watching us," the unidentified crew member said, according to Cadena Ser. Amadeo Alvarez Gomez, told Spanish National Radio. Negotiations are under way and going well, she added. The government declined to comment on any negotiations that might be taking place. Nigeria ranked as the No. 1 hot spot amid a lack of effective law enforcement. Its 10 reported attacks (most of them off its main city of Lagos) accounted for one-fifth of the global total. India and the Gulf of Aden off the northern coast of Somalia tied for second place among pirate-troubled territories, with both reporting five incidents apiece. Those in India were low-key attacks aimed at theft, while the Gulf of Aden was prone to hijackings. (I'm not sure these numbers take into account the 20% increase seen in pirate attacks off the coast of Somalia alone for the first three months of this year. ) But back to the Le Ponant. 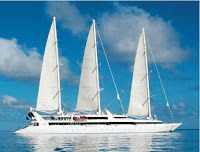 A ranson of $2,000,000 was paid for its release, but did you know that only $200,000 of the ransom money was found with the Le Ponant pirates when they were captured by French forces? Where did the rest of the money go? The IHT is reporting this about the Japanese tanker attacked on Monday. "Pirates in the lawless Gulf of Aden off Somalia fired on a Japanese oil tanker Monday, unleashing hundreds of gallons of fuel into the sea...The tanker attack helped send crude oil prices to a new record, spiking above $117 a barrel Monday before falling back slightly." Moslem Pirates don't get none. 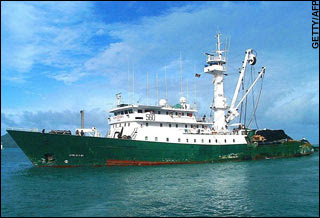 The picture (r) shows the pirate activity off the coast of Somalia in 2007 which is up 20% in the first three months of 2008. Busy little buggers, eh? It's definitely getting hot down there. It's interesting to note that the Dutch government took over for Denmark and began escorting the UN relief ships early this month. Is it time for security on board ships traversing this shipping lane? Or is it time to just go in there and clean effing pirate house? to end Playa de Bakio pirate siege. Contact has been made with the boat and they look to be headed to Somali town of Gaan, about 50 kilometres (30 miles) from the southern town of Obbia. Speaking in broken English on Spanish National Radio (RNE), a man who appeared to be one of the pirates said Monday they wanted "money," after snatching the phone from the boat's captain who had been contacted on board. "I am the captain of the boat... we are all well and there is no problem, for the moment there is no problem," the skipper said in Spanish, before being interrupted by the pirate who said he was a member of a "Somalia militia." Spain appealed to France, the United States and NATO on Monday for help in ending a crisis sparked when pirates seized 26 crew members of a Spanish fishing boat off the Somali coast. The defence ministry said a Spanish military frigate was heading to the area off east Africa, where the pirates have demanded money for the release of the crew, a day after storming the vessel armed with grenade launchers. It said the ship would arrive in 24 to 36 hours. Deputy Prime Minister Maria Teresa Fernandez de la Vega chaired a meeting of senior cabinet members, including Foreign Minister Miguel Angel Moratinos and Defence Minister Carme Chacon, to discuss the crisis. "We have sought the help of France and the United States," two countries with a military presence in the area, a Spanish government spokesman said. The defence ministry "has already entered into contact with NATO authorities," the government said in a statement. It said Madrid is also in contact with "Britain and other allied countries and friends with a military presence in the area." About Spain's newly sworn in and heavily pregnant defense minister Carme Chacon. She has zero experience in matters of military defense and is a lifelong committed pacifist. But who cares about all that - not when you can fret about her state mandated maternity leave. Words fail. Thank God the EU and the UN can be counted on to offer resolutions. Wastrels. There was another attempted pirate attack on Monday. Interested? On Monday, a major Japanese oil tanker was damaged and then chased by heavily armed pirates off the coasts of Somalia and Yemen but no one was injured, officials and crew members said. The 150,000-tonne Japanese tanker Takayama, with a crew of 23, sustained damage but was able to sail on its own power after the attack at about 4:40 am (0140 GMT) Monday, its owner and operator Nippon Yusen Kaisha (NYK Line) said in Tokyo. "We heard one big boom at first and then we were chased by the group for about an hour," a crew member told Japanese public broadcaster NHK. "We were attacked on the left and the right sides of the ship at least four times." The attack occurred in international waters some 440 kilometres (275 miles) east of the Yemeni port of Aden, Japanese officials said. Fate of the crew is unknown at this time. A Spanish fishing boat with 26 crew on board has been seized by pirates off Somalia, officials in Spain say. They say the Playa de Bakio - a Basque tuna boat - was attacked about 250 miles (400km) off the coast. A source from the Basque regional government said the boat was in "international waters". The fate of the crew is unknown. A source from the Basque government's Agriculture, Fisheries and Food department told Spanish news agency Efe that four armed pirates took control of the boat using grenade launchers. The source said the crew was made up of 13 Africans and 13 Spaniards, and the boat suffered "some damage" in the attack but is "navigable". The boat is currently heading towards Somalia, the source added. The Playa de Bakio was taken in the same area as the Le Ponant. "The defence ministry has instructed one of its ships which is nearby to head immediately to the area of the incident," the foreign ministry's statement said. A Spanish military frigate that was in the Red Sea was heading towards the are where the fishing boat was seized, a government source said. The defence ministry has also been in contact with military officials of nations with a military presence in the area to request "logistics support and help in locating the affected boat, the statement added. Dear CNN, call me crazy, but I think being forcibly boarded by thugs wielding guns and grenade launchers sure sounds like PIRATE to me! 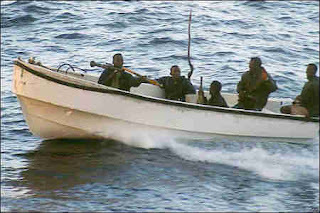 Presumed Pirates take fishing boat off Somalia. Walks like a duck, quacks like a duck, and all that. Al-Qaeda in Iraq tape calls for monthlong surge...and the celebratory beheading of an American. "We call on our beloved ones ... that each unit should present the head of an American as a gift to the charlatan Bush ... in addition to one of the apostate servants and slaves of the awakening (councils) during a one-month period," he said in the tape, posted on an Internet site known for its militant content. Commercial activities were paralysed in northern Nigeria's largest city Kano on Sunday when Muslim traders protested an alleged blasphemy of the prophet Mohammed by a Christian trader. Hundreds of angry traders at the Sabon-Gari market were seen setting bonfires on major streets leading to the market, and called for the killing of the trader. 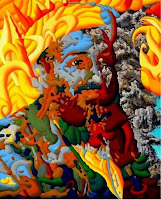 He was accused of putting blasphemous writings onto the walls of his shop against Mohammed, Islam's holiest figure. "A Christian trader was accused of making some blasphemous inscriptions against prophet Mohammed in his shop by his moslem colleagues who pounced on him," Kano police spokesman Baba Mohammed told AFP. He said the man escaped to the police station in the market, from where he was quickly ferried to the state police headquarters for protection. "We have made several arrests of persons suspected of attempting to breach the peace while the suspect is in our custody pending conclusion of investigation," Mohammed said. He said the police used tear gas and fired shots in the air to disperse the protesters, while the market and other businesses were shut to prevent the situation from escalating. Muslim-dominated northern Nigeria has been a hotbed of religious strife in the west African country of some 140 million inhabitants. In 1996, a number of Muslims scaled the fence of a prison in Kano where a Christian, Gideon Okah, was in protective custoday after he was accused of sacrilege against the Koran. Okah was subsequently killed, with his murderers hoisting his head onto a spike in jubilation. That's right - they put his head on a spike. This is pure terror. And pure Religion of Peace. After hearing NOTHING for months about the Pakistani envoy who was seized in the Khyber Pass, he has finally been shown on a tape broadcast by al Arabiya and "claiming to be held by Taliban militants" (What's with the "claiming" BBC, like he's making the whole thing up?) and urging the Pakistani government to meet their demands. What are they demanding? A prisoner exchange for a Taliban commander currently in Pakistani custody. He also spoke directly to Pakistan's Iranian and Chinese ambassadors, saying: "I urge them to do what they can to keep us alive and fulfil all the Taleban's demands as soon as possible so we can be released and return home, God willing." Our prayers go up for his (and his driver's) safe release. the US Embassy in Beirut was attacked. Twenty-five years after terrorists detonated a massive car bomb, killing 52 people at the U.S. Embassy in Beirut, President Bush urged unity in condemning terrorism he said continues to threaten the United States. 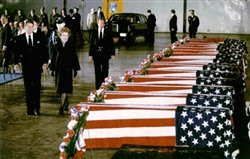 The Islamic Jihad Organization, today known as the terrorist group Hizballah, launched the April 18, 1983, attack that left 17 Americans and 35 Lebanese citizens dead. Those killed included Marine Cpl. Robert V. McMaugh, an embassy guard, and Army trainers Sgt. 1st Class Richard Twine, Staff Sgt. Ben H. Maxwell and Staff Sgt. Mark E. Salazar. Employees of the State Department and U.S. Agency for International Development and members of the Central Intelligence Agency’s Middle East contingent were also killed. President Ronald Reagan quickly denounced the “vicious terrorist bombing” as a “cowardly act” that would not deter U.S. goals of peace in the region. We've sure seen how those goals of peace worked out, haven't we? Fatwa on labeling urine or stool samples with any of the 99 names of Almighty Allah. A fatwa has been issued by Dubai Islamic Affairs Department (DIAD) to ban printing of names that include the 99 names of Almighty God such as Abdul Rahman, Abdullah, Abdul Salam as well as names of prophets and saints on the labels of sample bottles provided by hospitals and laboratories to the patients. A top official at DIAD said the fatwa bans writing or printing the name of Almighty God on stool or urine samples desecrates the glorious names of God. The DIAD advised the hospitals and laboratories to write the file number of the patients on the bottles. The DIAD has alerted the Ministry of Health and Dubai Department of Health and Medical Services (DOHMS) to implement the decision in order to stop this practice immediately. The official explained that “Asma-ul Husnaa” means the Excellent Names of Allah, which are also known as the 99 Attributes of God that are considered glorious and sacred. Did the Obama flip off Hillary? Or just have an itch that needed scratched with his badfinger. From Politichill ... courtesy of the FR. I have outstanding tags over at Wolf Howling and Always on Watch. I have sympathy cards to write and it is eating me up not getting them done. We had snow last night - which meant shoveling the driveway first thing this morning. Not enough snow for the snowblower - enough to freeze if you didn't shovel it. That meant get busy. Then, Charlotte, my "progressive" liberal girlfriend called and wanted to talk and talk and talk. I admit I was so put off by our last conversation about the Presidential race that I had kind of been avoiding her. So today, I just tried to listen to her expound about the Democratic candidates and be a good friend. She'd been in the wine. It was not easy. They are getting ready for chickens down on the Farm. In between, it was time to put my new Master Bedroom Closet back together (After having workmen in the house for two days which I hate) and now my leg is numb and my back is killing me. Oy. Getting old. Posting may be light over the next few days. Or not. You know how it is. Well, the Lord and Master has just passed judgment on the closet job. I did a dynamite (dinah-mite?) job. I only wish I would have taken a before and after. So this is what has been happening in Dinah-land. with absurd edits that illustrate the foolishness that is the Democratic party today. "that neither attempts to strip our public spaces of religious expression nor denies the ultimate source of our rights and liberties"
"Whereas Pope Benedict XVI has spoken out for the weak and vulnerable, witnessing to the value of each and every human life". Terrorism and weapons charges added for Mohamed. Additional charges regarding devices found in their car trunk levied against both. TAMPA - Twelve days before they were scheduled to go on trial, two former University of South Florida students are facing new charges handed up by a federal grand jury. The new seven-count indictment adds terrorism and weapons charges against one of the defendants, Ahmed Mohamed. It also includes a new charge against Mohamed and Youssef Megahed relating to the devices found in the trunk of their car when they were arrested Aug. 4 in South Carolina. It replaces a two-count indictment handed up last year. This is so infuriating I can hardly bring myself to post it. The Imam of Canterbury says middle east Christians are facing persecution because of "American Global project." Dr Rowan Williams will say that many Christians have been forced to flee their homes in the Holy Land because of 'appalling pressure' from extremist Islamic groups. And he will warn that historic communities risk becoming mere 'museum pieces' in the 'theme park' Middle East because of the military policies of the West. And what, pray tell, does he think Londonistan has become???? A stunned dad and his little boy were banned from swimming at a popular public sports centre - because they are not Muslims. Last night embarrassed management at the complex said staff were wrong to turn customers away from the designated 'men-only modesty session' on Sunday morning. The council says the special early-morning get-togethers are aimed at community groups who have strict rules on segregation. At least the Daily Mail comes out and calls it for what it is, and that is segregation. Lord forbid Moslems should swim with an infidel or - horrors.! I don't know, what would be more haraam for them swimming with a woman? Or a Jew? Again, ignorance of the religion of Islam is to blame. The Muslim men-only swimming session has rules to abide by. Islam commands Muslims to adhere to a high level of modesty with regard to dress code. Men are not allowed to expose the area between naval and knee to anyone other than their spouse and at the same time, they are not allowed to look at that part of the body of other men. This means the shorts would typically be knee length when these guys go swimming and they'd be tugged up to the naval as well. The non-Muslims who wanted to join them would be wearing normal swimming trunks and would therefore not fulfil the criteria. The sports centre staff should have been told the requirements regarding the trunks and then the father and son could have been told these requirements. At least then they wouldn't feel discriminated against. While being treated like second class citizens in their own country. at the White House last night. (Evidently, there's some rule about the pope not eating in public) But Imam Talal Eid of Boston did. A reliable GOP aide informs Townhall that Senate Democrats are blocking a measure to commend Pope Benedict XVI because of “controversial” religious language used in the text of the resolution. The Pope arrived in Washington Wednesday for a six-day visit to the United States. He delivered an address on the White House South Lawn that morning to praise the America for preserving religious freedom at home and abroad. "Whereas Pope Benedict XVI has spoken approvingly of the vibrance of religious faith in the United States, a faith nourished by a constitutional commitment to religious liberty that neither attempts to strip our public spaces of religious expression nor denies the ultimate source of our rights and liberties"
"Whereas Pope Benedict XVI has spoken out for the weak and vulnerable, witnessing to the value of each and every human life;"
The Senate resolution has bipartisan sponsorship. Republican Sen. Sam Brownback (R.-Kans.) introduced the resolution on April 15. It is cosponsored by Democratic Sen. Bob Casey (Pa.). Both senators are Catholic. The was offered for passage by unanimous consent, meaning the Senate could pass it without a vote, through a procedure called “hotlining.” The resolution could not be “hotlined,” however, because of Democratic objections to the statements listed above. Until Democrats lift their objections, or the resolution is modified, it remains in limbo. Clinging to her faith as photo op... Nancy Pelosi, on the other hand, is taking the Papal Bull by the horns and is planning a press conference to comment on the Pope's visit (this ought to be a lulu)and to keep the President (ergo the Republicans) having a monopoly on him. I'm sitting here all happy go lucky watching the Pope celebrate Mass at Nationals Park and then I see this rolling across my RSS feed. Suicide bomber kills 42 at funeral. two .25 caliber semi-automatic pistols, a .22 caliber Ruger rifle, and a .22 caliber Browning pistol with a silencer. They also found a copy of the “Anarchists Cookbook,” reportedly bookmarked on a page with a recipe for ricin, which is derived from castor beans. They also found some syringes and beakers in the apartment, though it’s not clear on what Von Bergendorff was planning on doing with the stuff. A federal judge in Miami has declared another mistrial against six men accused of plotting to spark an anti-government war by toppling Chicago's Sears Tower and bombing FBI offices. U.S. District Judge Joan Lenard ordered a mistrial when jurors reported after 13 days of deliberation they were hopelessly deadlocked in the case of the so-called "Liberty City Seven." The first trial ended in a mistrial in December because of a hung jury for the same six defendants and the acquittal of a seventh. It is unclear what the prosecution's next step will be. Indonesia: 2 JI suspects arrested on suspicion of involvement in the beheading of 3 Christian schoolgirls were on their way to Syria to meet with "an international terrorist network" when arrested in Malaysia, according to the Indonesian police. The police said they "are not sure what group they are referring to," O-kay. Three guesses and the first two don't count...oh, and did I mention yesterday that one of these dirtbags was a medical doctor? More of his fine healing handiwork can be seen in the photo - left. Somali Pirates transported to Paris for questioning, possible trial. (Unless they just decide to offer them asylum and a cushy life on the dole like the UK) Six Somalis accused of taking a luxury yacht's crew hostage have arrived in Paris on a military plane to face questioning, judicial sources said. Maliki confident of defeating al Qaeda. "We are more confident than ever that we are close to a definitive victory over Al-Qaeda and its lawless allies." Maliki said the jihadist movement was in a state of "total isolation" in Iraq and was seeking "refuge beyond the borders" in neighbouring nations, which he urged to do everything possible to stop them from infiltrating. Hey Pipsqueak, you got that? Lahore: Pakistan's political turmoil and violence have claimed a high-profile cultural victim - a centuries-old kite-flying festival that draws thousands of visitors. The Basant festival brings a springtime buzz to eastern Pakistan and its regional capital, Lahore. Officials usually relax a ban on the pastime - imposed to prevent abandoned strings that are often covered with crushed glass from slitting people's throats. British police and security agencies are monitoring 30 terror plots, Home Secretary Jacqui Smith told a tabloid on Sunday.“There are 22,000 individuals who are being monitored. There are 200 networks involved and 30 active plots,” Smith said in an interview with the News of the World.“We now face a threat level that is severe. It’s actually growing,” she said. Yemen: Another bombing. 3 policemen killed. 4 civilians injured. While we're on the subject of Yemen... and just in case you haven't read Gary Swenchonis's Open Letter to the people of Yemen, yet. Please do. Gee, Officer Krupke. They're depraved on account of being deprived. I agree this is part of the equation - however the Beeb completely ignores the role of the Moslem religion and Afghan government in sanctioning these marriages. A midwife in the village of Khordakhan, Hanufa Mah, agrees that alleviating poverty is key. She says she tries to teach parents not to marry their girls too young but some feel they have no choice. One girl she helped through labour was only 10 years old. "The girl was so small. I held her in my lap until the child was born," she says. He says: 3000 killed whose names were never published - who were they? 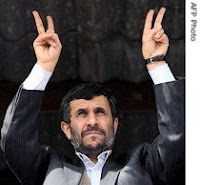 Iran's President Mahmoud Ahmadinejad on Wednesday reaffirmed his doubts about the accepted version of the September 11, 2001 attacks on the United States, describing the strikes as a "suspect event". "Four or five years ago a suspect event took place in New York," Ahmadinejad said in a speech to a public rally in the holy city of Qom broadcast live on state television. "A building collapsed and they said that 3,000 people had been killed, whose names were never published. 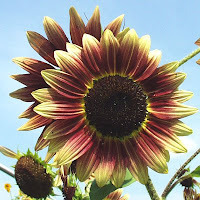 "Here is the beginning of my post. This is the third time in a week that he has raised the issue - trying to take the focus off the Pope's visit to Ground Zero? Death brings negotiations to an impasse. No word on who killed the negotiator. Anyone care to hazard a guess? A mediator involved in negotiations to free two Austrian tourists kidnapped by an al-Qaeda affiliate in Tunisia is believed to have been killed. 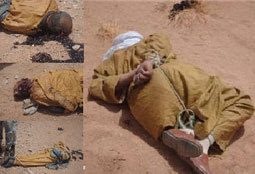 According to an Algerian source quoted in the Arab daily, al-Sharq al-Awsat, the Tuareg mediator was murdered in a region on the border of Mali and Algeria. His death has reportedly brought a stalemate in negotiations between Austrian authorities and representatives of Abdel Hamid Abu Zayd, local head of the Al-Qaeda Organisation in the Islamic Maghreb.